The grea test revelation of truth comes when you are confronted with the proverbial fork in the road. You have the choice to go right or left, but that’s not the revelation, the revelation comes when you understand that you have no idea which way to go. You are forced to consider that there is a higher authority than you, the one who created the road. We have in our culture this idea that we as a human race can figure anything out, we see movie after movie demonstrating that idea. There is an asteroid approaching the earth and unless we react quickly we will be destroyed. We will find a way, a hero will step forward and somehow stop that asteroid. In the end, the hero saves the day and restores hope in humanity, that where there is a will there is a way. Jesus is our hero, Jesus is the one that can bring light into the darkness, and hope to the hopeless. The gospel is that Jesus came to bear witness to the truth, that’s the good news. The greatest revelation comes when you have no idea what to do, or which way to go because it’s in that moment that you can see Jesus. We need to step out of the way and let Him lead. 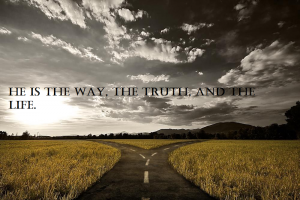 He is the only one that knows the way because He is THE WAY, THE TRUTH, and THE LIFE. It does not matter who you are or how long you have been serving the Lord. We are all capable of falling when we turn away from God. It is with in your DNA to make mistakes, to trip and fall on your face. But I know a God that can change who you are, he can change your DNA. Asaph was a man of God without a doubt, he was a worship leader in the house of God, and he authored Psalms 50, and Psalms 73 to 83. We know that he was appointed minister of music by King David in 1 Chronicles. We know that he was of a Godly family. He probably looked the part and had all the priestly garments that was of the day. He probably spoke right and said all of the right words used by the religious of the day. I am sure that it was not a show, he was truly a man of God and lived what he preached. But as we look at Psalms 73:1 we can see into his heart and what he was thinking at this point in his life. He said that his feet were slipping, he was not referring to the way he walked physically. He wasn’t saying I tripped today and almost fell on the ground. He was referring to his walk with God. He was talking about how he lived for God. He said I know that God is good, I know he is. But as for me, I was falling, and I was almost gone. Why was a man who lived in and near the temple all his life, falling? Why was his faith shaken? What could have happened to this man that made him question Gods plan. Pride crept in and had began to destroy him from the inside out. He was probably still ministering, still singing, still playing the drums, the cymbals, the brass instruments, the bible says he played. Have you ever caught yourself in a thought that started as something small and then 15 minutes down the road you were angry and anxious about a person or an incident that otherwise you wouldn’t have been. The incident could have happened years ago but one thought brought it back and then you began to dwell on in. Before you know it you are feeling the pain of it all over again. Maybe some one did something to you by accident and it wasn’t a big deal at first but you went home and began to think about it. Some of you have gone as far as to confront that person and more problems have come of it than if you would have just given it to God. What am I doing, I have prayed and received no answer. I feel like God is not hearing me. Have I done what is right for no reason? Maybe I should just not go to church anymore if this is how it’s going to be. I have served God for 20 years and I see only the wicked prospering. Asaph had taken his eyes off of God and put them on himself. Everything was turning inward. Has this ever happened to you? Is this happening to you right know? Have you got your eyes off of Jesus and began to look at yourself and what is going on around you. When you allow the devil to speak into your life, he never gives you the full picture, he gives you his version of it. I am sure this is what is going on in Asaph’s mind here. He goes on for several verses complaining about the wicked and the injustice of their prosperity, and then he tries to understand it but cant, then he comes to the corrects conclusion that we all need to come to. In verse 17. But wait not only did he realize the end of the wicked, he saw his own heart. He was falling and was going away from God. He didn’t turn from knowing God was real but he was mad that the wicked were prospering and growing. He was so upset that he was saying, “What’s the use in being a good man, a man of God”? But he was healed when he came into the sanctuary of God, into God’s presence. What was the sermon that day I don’t know? But I know God and I know that God is personal. I am willing to bet that God saw his heart, and said today’s message will be for Asaph. If Asaph had not gone into the House of God and heard whatever the message was that day, or if he had failed to pray that day he would not have been healed. He would not have understood the questions that he had; he wouldn’t have realized that his heart was bitter, and all torn up inside. He wouldn’t have realized that he was being foolish and ignorant. He was bitter and torn up inside, all of his focus had been turned from God on to his problems and the wicked of his day. Pride had crept in and it was all about him and how bad he had it. God why am I serving you if all I get in return is bad? But the wicked do there thing and they seem to be prospering. We have all probably asked these questions at one point or another. God why? We all probably have the testimony of going through hard times and then coming into the house of God and hearing a word that turned everything around. No matter where I am go through or what is happening, no matter if the wicked seem to be doing well and I am not, NO MATTER. When I can’t seem to figure out the answer to WHY? The only answer that matters is YET I STILL BELONG TO YOU! What glorious hope we have as believers. with foaming wine, well mixed, and he pours out from it, and all the wicked of the earth shall drain it down to the dregs. 9 But I will declare it forever; I will sing praises to the God of Jacob. 10 All the horns of the wicked I will cut off, but the horns of the righteous shall be lifted up. As humans, with the limited mind and understanding that we have been given by God we think more highly of our intellect that we should. If we cannot understand why then we judge God of being unfair or wrong, or we are just angry that God allowed such a thing. When something happens in our life that is tragic or hard to deal with, our fallen nature tends to need to blame something or someone. Most often we blame God. We just cannot comprehend that because of this fallen nature and because of sin, bad things happen to good people. We cannot wrap our mind around this. In actuality none of us are good people, because of sin we are filthy rags in our best condition, which is why we need Him. We are only clean when we are in Him, yet this carnal nature still has to live in this fallen world with other fallen people who do not adhere to Christian standards and beliefs. Living in a sinful world and means that sometimes other people’s sin affects us. This is why bad things happen, and yes even to us Christians. 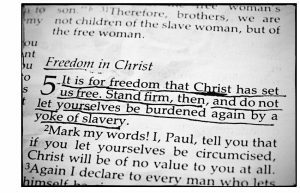 This is proven time and time again in scripture, we see Christians suffering. They suffered through trials and just plain old life circumstances. The questions is this: can God get as much glory out of some one suffering through a life circumstance as He can from, let’s say a martyr? I think the answer is yes. We often rank the things we go through. We also compare them with other people and the things they have gone through. Many of the apostles suffered from the hands of people who hated them just because they were Christians. I personally do not know what that feels like. But I do know what it feels like to be tested by life’s circumstances to the point I was in despair and almost in a state of depression. But I have and am overcoming, I have a testimony. I have known people who have lost children and now have great testimonies of emotional healing. I have known people who have suffered financially through no fault of their own and now have a testimony of God’s restoration. We all go through so many things in a lifetime and not all of us go through the same thing, but God can get the glory out of all of it the same way He can get glory from a fallen saint that is physically persecuted. My point is this, God is in complete control. 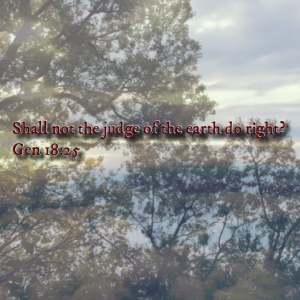 He will judge rightly and in His time. We all through things while we are here because we live in a fallen world, but the righteous will be exalted. This is His promise and He will not fail to come through. We can trust in Him and He demonstrates his power and authority by saying in verse 3, when the earth totters, and all its inhabitants, it is I who keep steady its pillars. What an all-powerful God we serve, He will judge in His time and with equity. When Jesus prayed that the disciples would not be removed from this world, but that they would be kept from evil. What was He saying? This has been a mystery for me, but as of late I believe that I have understood this in a way that I never have before. We probably read individual versus often several hundred times in a life time and each time depending on the situation we are in they are revealed to us in different ways. Never out of context, but the Holy Spirit shows us things that we never show before. Jesus prayed that we would not be removed from this world but that we should be kept from the evil one. Jesus never promised a pain free life or a life free from the burdens that come with living in a fallen world. 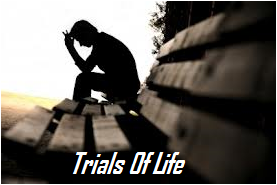 He never intended that we should not go through testing’s, or trials, or even temptations because this is all a part of being in the world, but to be kept from the evil one, I think, means that even though we go through these things as a result of being in the world they will not over take us. We are not kept from the world and the afflictions of this fallen world but He keeps us from being changed or destroyed by the evil of it, or the evil one, the devil our adversary. Can we be destroyed? The answer is yes, it is possible, but as long as we trust in Him and walk in His ways and according to His purpose trusting in Him in every step, He will keep us from the evil one. For some that victory comes in an answered prayed, a physical rescue, and for others that victory comes when we cross over into eternity. We do not know the way but we must trust in His plan and what His word says. Remember no matter what you go through, as painful as it may be the purpose of the fire is to root out everything that is not of Him. The apostle Paul who we know to have suffered in indescribable ways for the furtherance of this gospel described afflictions this way. He does not say this heavy affliction, or this horrible affliction, but he chooses to call his many afflictions which were heavy and horrible, light. Even as I write these words I am heavy and burdened down with afflictions that I cant describe in words. My heart morns and my eyes have no more tears to cry. Even in my afflictions, they do not compare to Pauls, and yet he says for our light affliction, which is but for a moment, is working for us a far more exceeding and eternal weight of glory. I stand in awe of those words; I must believe this and walk in this. There is an eternal plan for us and no matter what we go through, compared to eternity it is a light affliction and it is working for us and will prove to be worth it all.